Our wide range of delivery products vary from our latest online View the Rail product to custom built multi-screen displays with interactive touchscreen options. All our products enable you to gain greater depth of insight to a site or project, undergo digital rehearsals and walk-throughs of complex models and bids, or deliver powerful and unique experience through immersive and engaging 360° media. 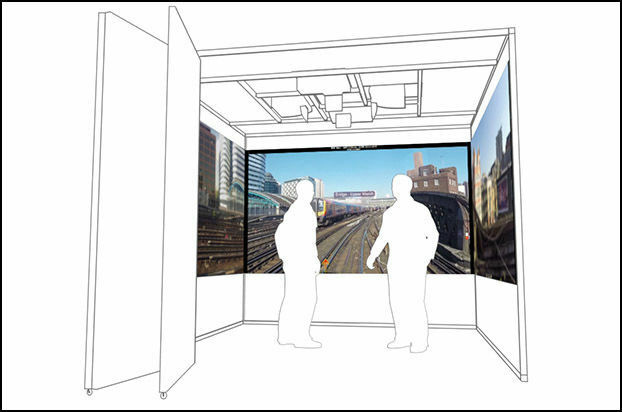 A bespoke portable room offering a full 360° immersive experience with footage projected on to all four internal walls. Touch screen options are available. Stand inside your project or digital rehearsal room and walk through a variety of complex scenarios. A theatre style display for audiences of 30-40 people with touch screen options available. The system enables you to turn any meeting in to an immersive theatre experience. This bespoke display system can be configured to fit any space, is quick to put up and can be supplied on wheels for easy re-location. Audience numbers can vary depending on the individual unit size. The Open system allows you to deliver immersive presentations and ensure greater understanding through heightened visualisation. A mini version of the open system for office use, allowing you to display varying layers of content to individuals or smaller groups. The Air system is our newest portable display, which is easy to transport and set up by a single user. The Air allows you to deliver content from any office or venue, but still gives the unique immersive experience you would expect from a Mission Room product. The portable system allows you to see more of your immersive content on the move. The system packs neatly away into a wheeled case and is quick and easy to set up. Mission Explorer software combines panoramic images, maps and multimedia to bring your site within reach and put information into context, all from the safety and convenience of your office. Allowing you to navigate, annotate and mark-up features and hazards, then quickly create and share work packs across the business. Mission Presenter combines software, media and displays to enable you to create powerful and engaging multi-screen presentations. A variety of media and software can be integrated to deliver a more immersive, clearer picture to your audience. Our 360° multi-screen web browser enables you to take online content and display it across multiple screens, with touch screen options, giving you a unique immersive experience. An online 360° view of your rail project. It allows you to access the content from any location and step along the track, quickly navigating the map using pre-marked assets, mileage and chains.